Vaseline Total Moisture Aloe Fresh 24hr Nourishing Body Lotion has a fresh aloe vera fragrance. Its texture is non-sticky and non-greasy. Vaseline® Total Moisture® Aloe Fresh Lotion leaves your skin feeling light and fresh. Vaseline Total Moisture Aloe Fresh Body Lotion comes in green coloured plastic bottle with flip top cap. 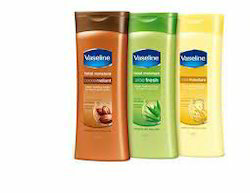 Vaseline Aloe Fresh Lotion is available @ Pooja Medical Store.